And you thought I was crazy… Check out this article by Freeman Dyson in the October 1968 issue of Physics Today entitled “Interstellar Transport.” Dyson was an active participant in Project Orion, a program to build interplanetary space vehicles propelled by nuclear bombs. After the program was ended by the 1963 nuclear test ban treaty, he decided to write a paper for a high visibility journal to insure that the idea was kept alive and people were aware of its potential. People thought big in those days, and Dyson’s notional interstellar transports certainly reflected the fact. The first was designed to absorb the blast of one megaton deuterium fueled bombs in a gigantic copper hemisphere with a radius of 10 kilometers weighing 5 million tons. The fully loaded ship would have weighed 40 million tons, including 30 million of the one megaton bombs. Assuming each bomb would require 10 pounds of plutonium (or about 60 pounds of highly enriched uranium), a total of 150,000 tons of plutonium would be required for the mission. As a voyage of colonization a trip as slow as this does not make much sense on a human time scale. A nonhuman species, longer lived or accustomed to thinking in terms of millennia rather than years, might find the conditions acceptable. If we continue our 4% growth rate we will have a GNP a thousand times its present size in about 200 years. When the GNP is multiplied by 1000, the building of a ship for $100B will seem like building a ship for $100M today. 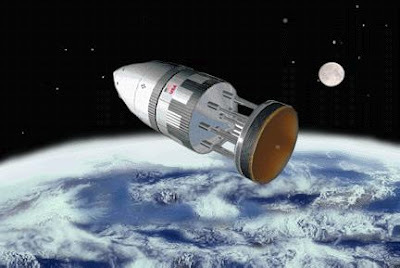 We are now building a fleet of Saturn V which cost about $100M each. It may be foolish but we are doing it anyhow. On this basis, I predict that about 200 years from now, barring a catastrophe, the first interstellar voyages will begin. I suspect Dyson wrote most of this paper “tongue in cheek.” He’s nobody’s fool, has remarkable achievements to his credit in fields such as quantum electrodynamics, solid state physics, and nuclear engineering, and remains highly regarded by his peers. Nobel laureate Steven Weinberg said that the Nobel Committee had “fleeced” Dyson by never awarding him the prize. The objections to his designs are obvious, but for all that, bomb-propelled space vehicles are by no means impractical. I suspect Dyson realized that other scientists would recognize ways they could improve on his “conservative” and “optimistic” designs as soon as they read the paper, and start thinking about their own versions. Project Orion might be dead as a budget line item, but would live on in the minds and imaginations of his peers. And so it did. 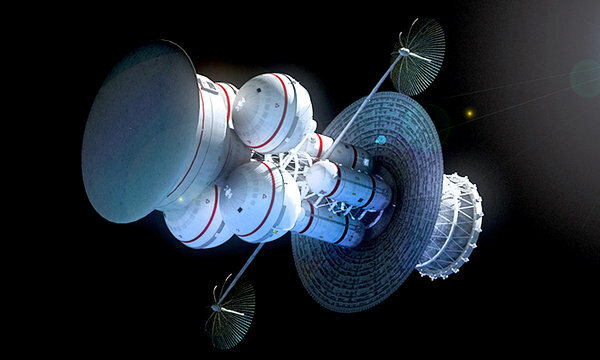 Why Not Start Interstellar Travel Now? We have already demonstrated the practicality of interstellar travel with Voyagers 1 and 2 and several other probes. Reasonably achievable travel times to nearby stars using chemical rockets and payloads weighing on the order of a ton are around 50,000 years. I suggest such voyages be launched with the purpose of seeding as many planets as possible with earth life forms. Morality is nothing in the abstract nature of things, but is entirely relative to the sentiment or mental taste of each particular being, in the same manner as the distinctions of sweet and bitter, hot and cold arise from the particular feeling of each sense or organ. Moral perceptions, therefore, ought not to be classed with the operations of the understanding, but with the tastes or sentiments. Cast in more modern terms, that means that the ultimate source of morality, or the perception of objects and actions as good or evil, lies in human emotional traits. Absent those traits, morality and, with it, good and evil, would cease to exist. Like most of our other significant characteristics, moral emotions exist because they evolved. The only reason they evolved is because they happened to increase the chances that creatures bearing those traits would survive and reproduce. In other words, when it comes to ultimate Goods, nothing trumps survival. I propose we seed nearby planets with life in order to survive. Of course, our species is not capable of surviving a voyage of 50,000 years. Other species, however, are. There are no human beings on the planet identical to me. All of them are more or less related to me. I am somewhat more distantly related to every other life form on the planet. We all share a common ancestor. If my species cannot survive the voyage, let others go. That works for me. My overriding interest is that life survive. How long it will do so on our home planet is uncertain. However, the quality of the environment is deteriorating rapidly, and I prefer not taking chances. What life forms shall we send? Certain forms of bacteria have survived a dormancy of 250 million years. Tardigrades or “water bears,” far more complicated animals with tens of thousands of cells have survived the vacuum of space, cooling to near absolute zero, and heating to over 150 degrees centigrade. We should choose the life form most closely related to ourselves that is likely to survive the voyage. In the case of tardigrades, the oceans of target planets might first be seeded with plankton before their arrival to serve as a food supply. At the end of the voyage, it would be necessary to make necessary adjustments to the craft’s trajectory, and then approach and perhaps enter orbit around the target planet in order to choose a favorable landing spot. Sophisticated computers would be necessary to carry out these tasks, and a source of power would be necessary to run them. A pure plutonium reactor might serve as the necessary power source. Of course, plutonium 238 is currently used as a power source for deep space probes, but it only has a half life of 87.7 years, and would have decayed almost completely by the end of the voyage. Plutonium 239, however, has a half life of over 24,000 years, and is fissile, meaning it could also serve as fuel in a very compact nuclear reactor. Its decay heat could be used to power timers and other devices that require minimal power during the voyage, signaling the reactor to turn on during the final stages. And what of our species? I doubt that it will be possible to send full grown human beings to planets around nearby stars any time in the foreseeable future. The energy requirements are just too great for achieving speeds sufficient for us to survive the journey. Seed ships are another matter. They might be sent with human embryos in suspended animation, to be cared for by robots at their destination, in prefabricated environments constructed in advance. Google “Project Hyperion” to see this idea developed in more detail. All this would require technologies that we have not yet developed. In the meantime, I suggest we get started with the technologies we already have.